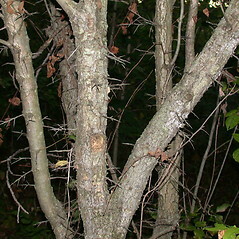 Frosted hawthorn is absent from the northern portions of the northern New England states except for Vermont's Champlain Valley, where it is present. There are two varieties in New England. flowers with 5-10 stamens and persistent sepals on pome nearly sessile or slightly elevated on a collar 0.3-0.8 mm tall (vs. C. pruinosa, with flowers with 12-20 stamens and persistent sepals on pome elevated on a conspicuous collar 0.5-1.7 mm tall). 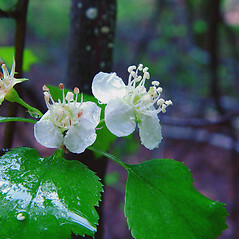 flowers with 5-10 stamens and upper surface of leaf blade with minute hairs for much of growing season (vs. C. pruinosa, with flowers with 12-20 stamens and upper surface of leaf blade without minute hairs for most of growing season). 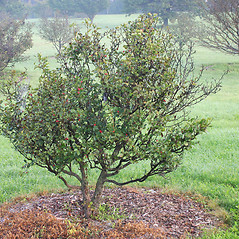 Crataegus pruinosa var. latisepala (Ashe) Egglest. 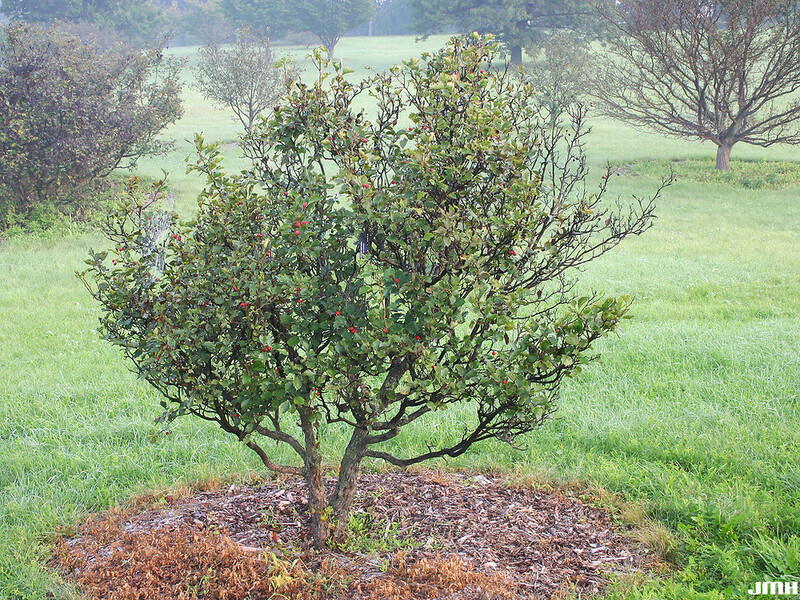 Crataegus pruinosa var. 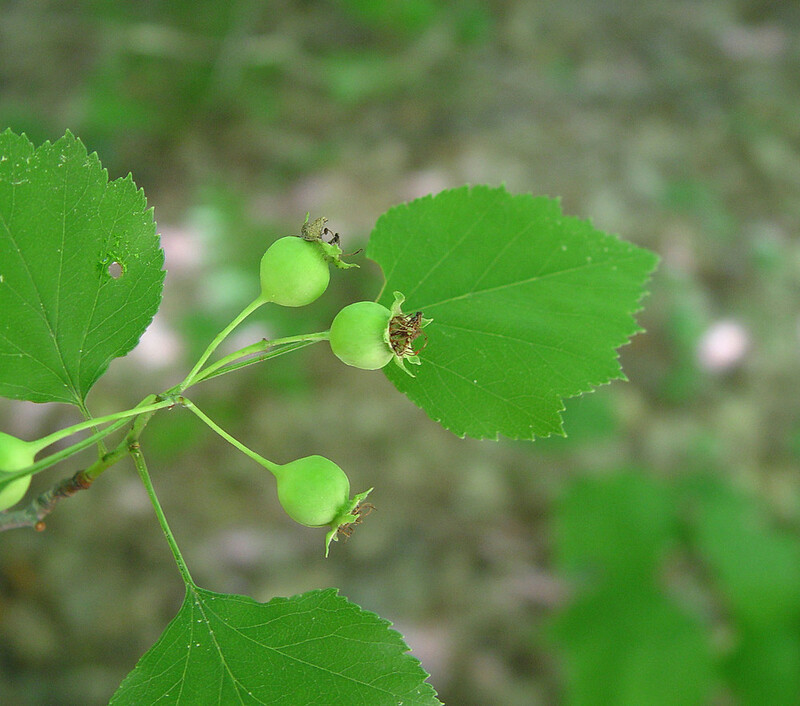 philadelphica (Ashe) Egglest. 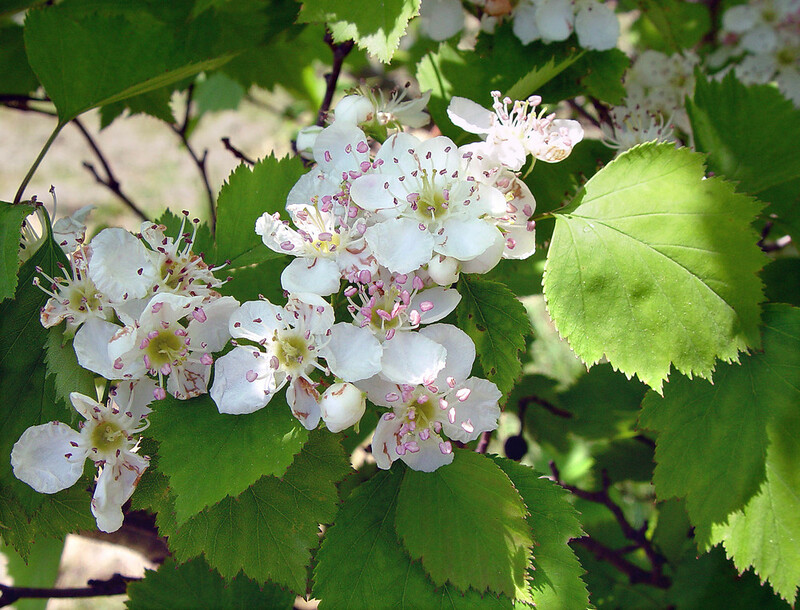 Crataegus pruinosa (Wendl. f.) K. Kochvar. pruinosa is known from CT, MA, ME, NH, RI, VT.C. pruinosa var. porteri (Britt.) Egglest. is known from CT, MA. frosted hawthorn. 39a. 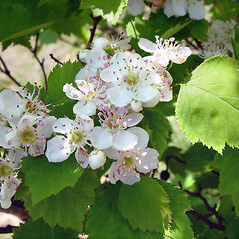 Crataegus caerulescens Sarg. ; C. cognata Sarg. ; C. conjuncta Sarg. ; C. leiophylla Sarg. ; C. porteri Britt. ; C. porteri Britt. var. 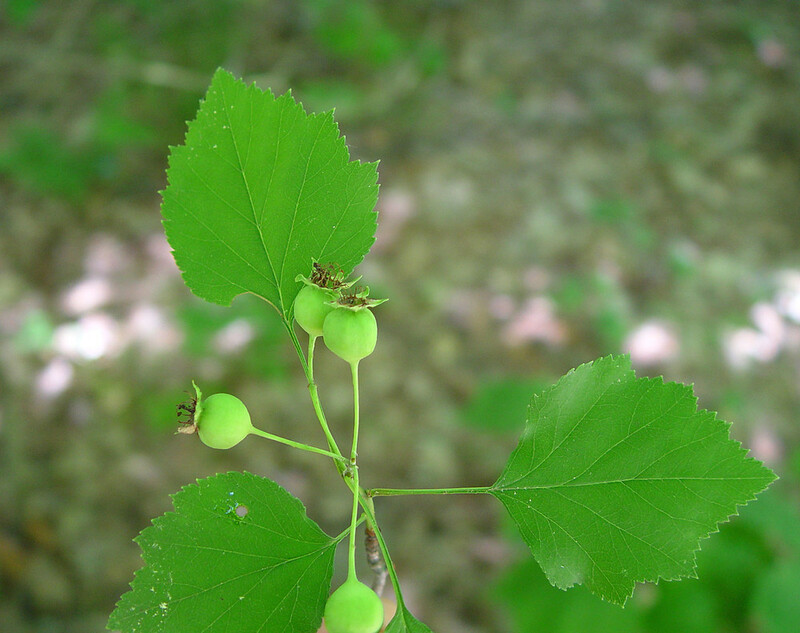 caerulescens (Sarg.) Palmer; 39b. 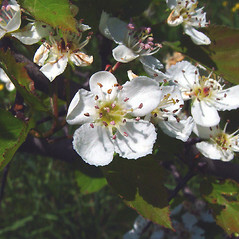 Crataegus festiva Sarg. ; C. littoralis Sarg. 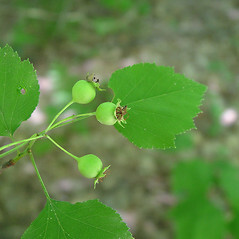 ; C. parvula Sarg. 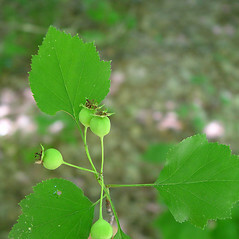 ; C. pequatorum Sarg. 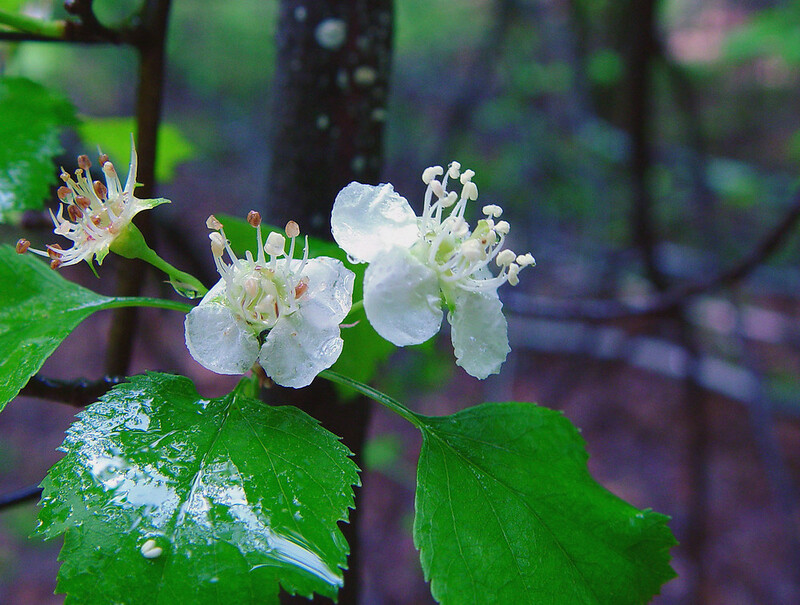 ; C. philadelphica Sarg. ; C. pruinosa (Wendl. 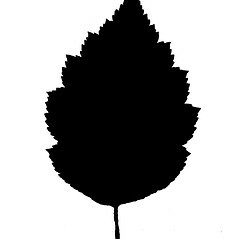 f.) K. Koch var. latisepala (Ashe) Egglest. ; C. pruinosa (Wendl. 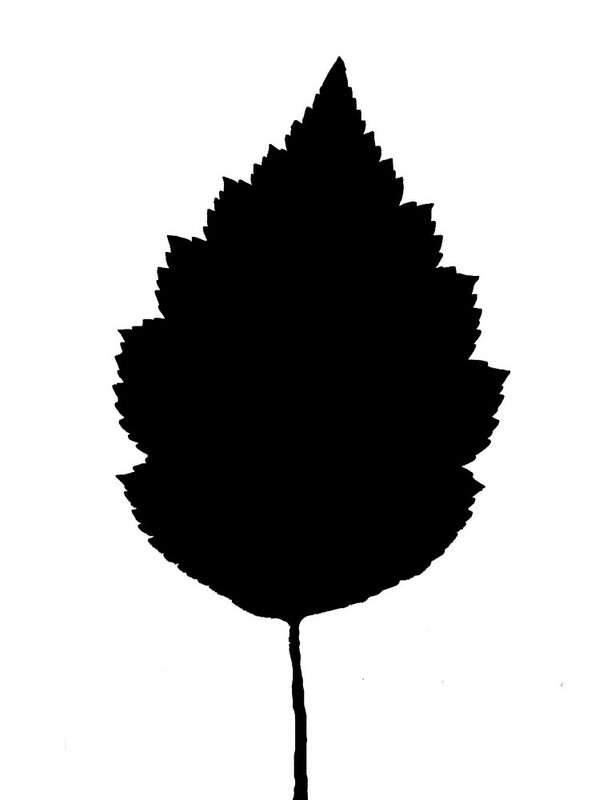 f.) K. Koch var. 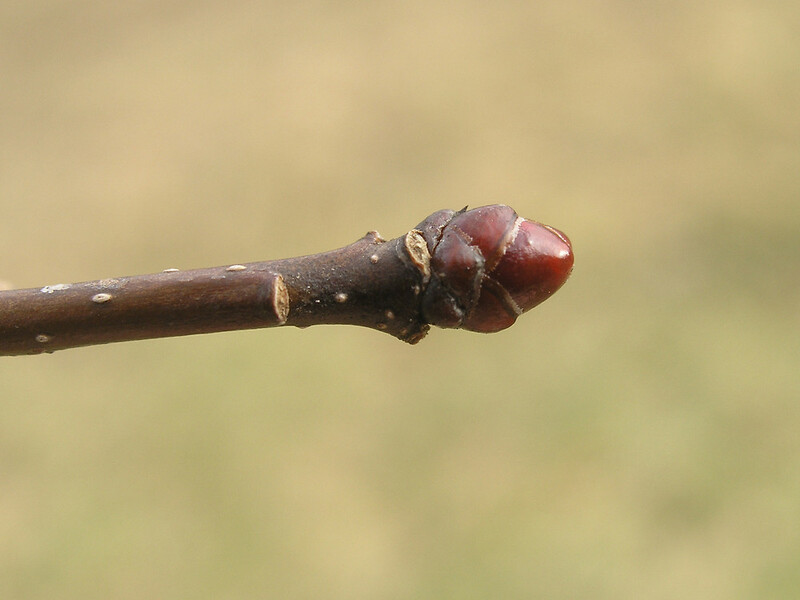 leiophylla (Sarg.) J.B. Phipps; C. pruinosa (Wendl. f.) K. Koch var. 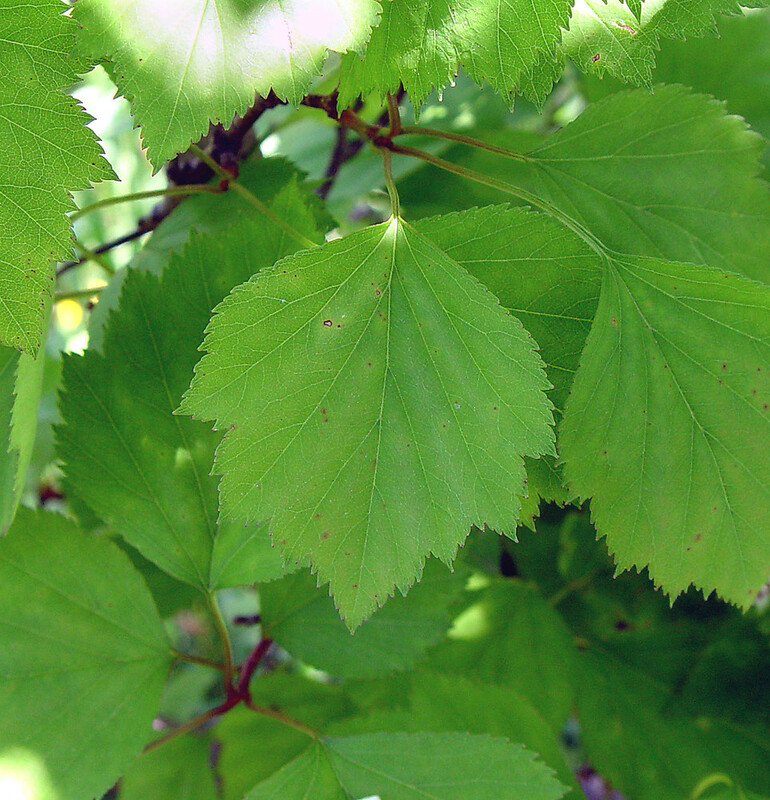 parvula (Sarg.) J.B. Phipps; C. pruinosa (Wendl. f.) K. Koch var. philadelphica (Ashe) Egglest. 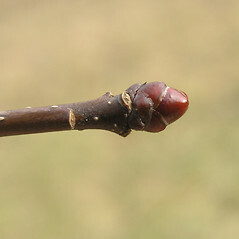 ; Mespilus pruinosa Wendl. f. • CT, MA, ME, NH, RI, VT; generally restricted to the southern portion of the northern New England states, but extending north in the Lake Champlain Valley of VT. Forest edges, successional fields, roadsides, early successional forests, forest clearings. Though this species has been subdivided into numerous varieties (Palmer 1952, Phipps and Muniyamma 1980, etc. 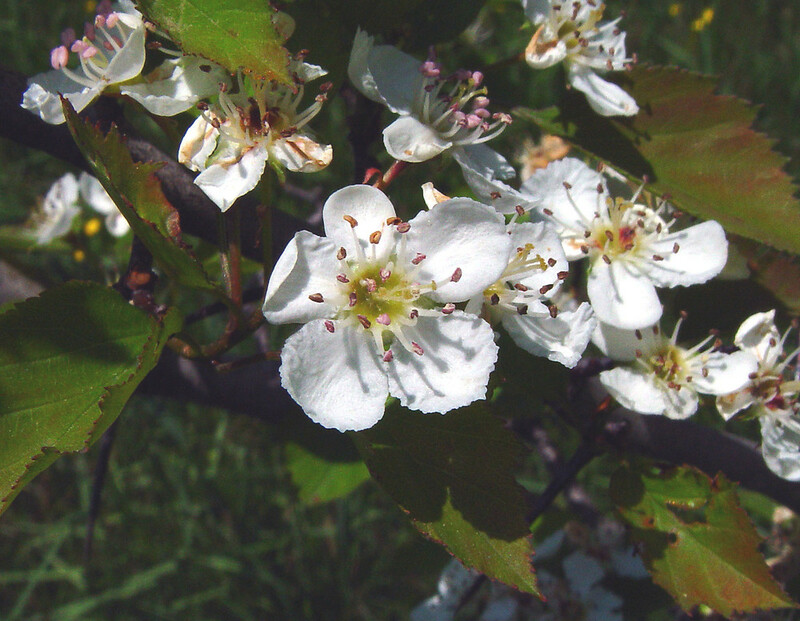 ), only two groups can be confidently recognized on the New England landscape. 1a. Anthers non-anthocyanic; pomes globose to obovoid to obpyriform, rounded to truncate or tapering to the base; flowers 17–19 mm wide … 39a. C. pruinosa var. porteri (Britt.) Egglest. 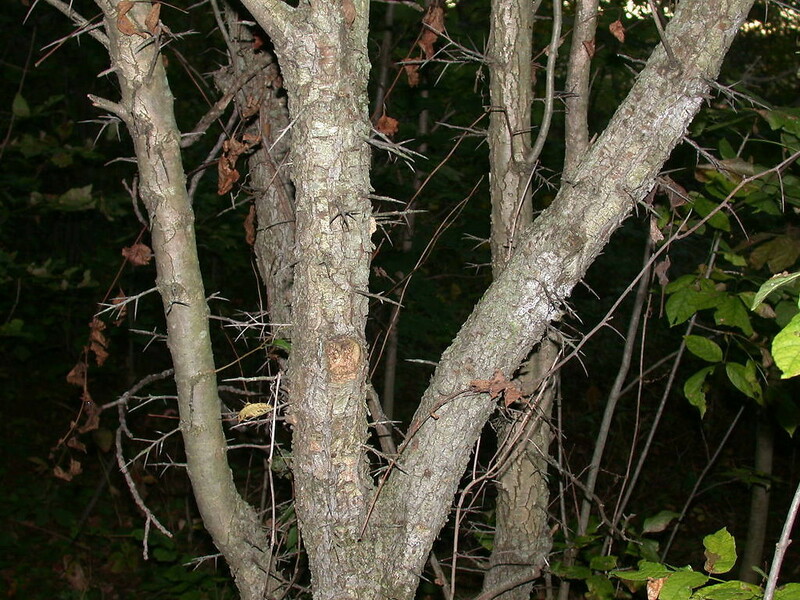 Variety porteri is known from CT, MA and is of conservation concern. Variety pruinosa is known from CT, MA, ME, NH, RI, VT.